Brendan Behan was an Irish nationalist playwright noted for the black humor of his work. He was a member of the IRA and was twice imprisoned for political offences. He was also a heavy drinker and bi-sexual. The political idealist is often found with important planets in either the 11th sign, Aquarius or the 11th house. The creative artist would be likely to have strength in the 5th house and sign, Leo. 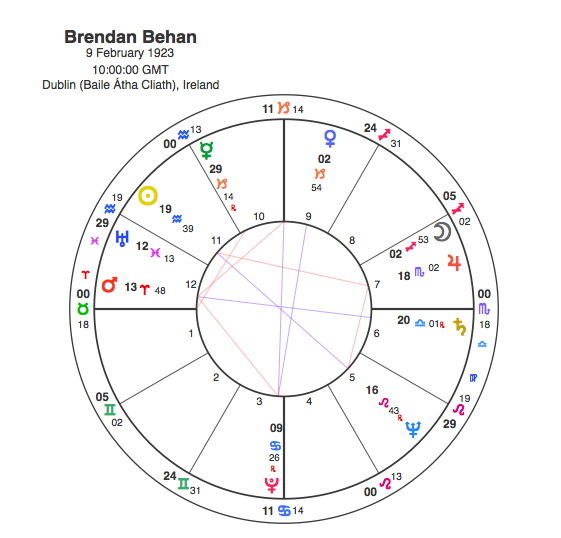 Brendan Behan had an opposition between the Sun in Aquarius in the 11th house and Neptune in Leo in the 5th. This opposition focused by T square onto an apex Jupiter. Jupiter in this position would incline him to extravagant and extreme actions. This placing often results in large appetites and indulgence and given the square from Neptune, heavy drinking and even alcoholism. Jupiter is in the 7th house, with the Moon in Sagittarius. Along with a square to the Sun in Aquarius, this would account for an open and experimental approach to relationships. Neptune will often provide inspiration to the artist but when it has challenging aspects it can also produce an idealism that borders on fanaticism. It can also result in a steady erosion and dissolution of hardened attitudes over time. Behan obviously felt pulled strongly in two different directions, that of politics and art. In the early stages of his life it was revolutionary politics. in 1939, Behan joined the IRA and embarked on an unauthorised solo mission to England to blow up the Liverpool docks. He was arrested and was sentenced to three years in a borstal and did not return to Ireland until 1941. Pluto ( the planet of revolution ) was opposite his Mercury and square his Ascendant in 1939, radically challenging his thinking ( Mercury ) and forcing him to act ( Ascendant ). He spent most of the war years in prison where he wrote his first play, short stories and other prose. After the war he began to feel restrained as an artist living with the social pressures in Ireland. He left Ireland to live in Paris in the early 1950s. There he felt he could lose himself and release the artist within. This was the watershed time for him as Pluto aspected his Sun and Neptune from 1950 – 2. This would clearly see the transition from radical political action to his writing as Pluto was conjunct Neptune in the 5th and opposite the Sun in Aquarius in the 11th. Behan’s fortunes changed in 1954 with the appearance of his play ‘The Quare Fellow ‘. Behan generated immense publicity for the play through a drunken appearance on the Malcolm Muggeridge TV show in 1956 as it started in the West End. In November 1958 ‘ The Quare Fellow ‘ began a run in New York establishing an international reputation for Behan. Pluto was square Behan’s Moon in 1958 – 9. In 1958 he also wrote an autobiographical novel ‘ Borstal Boy ‘ which focused on his earlier prison experiences. The book delineates Behan’s move away from violence. By the end the idealistic boy rebel emerged as a realistic young man who recognised that violence, especially political violence, was futile. This is the perfect description of the Sun in Aquarius in the 11th opposite Neptune. Naturally for someone with an apex Jupiter in square to Neptune and the Sun Behan was known for his drink problems, which resulted in him suffering from diabetes, which ultimately caused his death in March 1964. Behan once described himself as “a drinker with a writing problem” but he was given an IRA guard of honour at the biggest Republican funeral since those of Michael Collins and Charles Stewart Parnell. He lived and died as an expression of his T Square.